Researchers from two teams at the giant European particle accelerator at CERN reported additional findings that support the existence of the Higgs boson. The particle was discovered six years ago and further substantiated the Standard Model as a theoretical framework describing most of the universe’s forces and particles. Following the discovery, the Nobel Prize in Physics was awarded to two of the scientists who predicted its existence, Peter Higgs and François Englert. The recent discovery, announced by researchers at the accelerator’s CMS and ATLAS detectors, reinforces the Standard Model by adding supporting evidence to its validity, and especially to the predicted properties of the Higgs boson that have yet to be observed experimentally. In addition, it enables to construct or discard new ideas for answers to the Standard Model’s remaining open questions. The existence of a Higgs field, and its associated particle – the Higgs boson, were proposed in the 1960s as an addition to the accepted theories at the time, with the purpose of solving a problem at the heart of those theories: Where do certain particles acquire their mass? In those years, physicists noticed that two of the four fundamental forces of nature are tightly connected – the electromagnetic force and the weak nuclear force. This led to the development of the electroweak theory, which predicted the existence of particles that are affected by these forces, as well as those that carry it – photons as carriers of the electromagnetic force and particles called z and W bosons as the carriers of the weak force. However, this theory has one major pitfall: The particles had to be massless, yet measurements showed that some do possess a non-negligible mass. To solve this problem, physicists proposed a mechanism that gives mass to those massless particles through an interaction with an additional field. This mechanism would come to be known as the Higgs mechanism, the field was dubbed the Higgs field, and the particle that results from the quantum excitation of this field was named the Higgs boson. To support the theory and the field’s existence, scientists needed to find the particle and study its properties. This mission guided the scientists who planned and built the LHC particle accelerator, which began operating in 2008, built, among other objectives, to discover the particle and learn about the way in which it interacts with other particles. 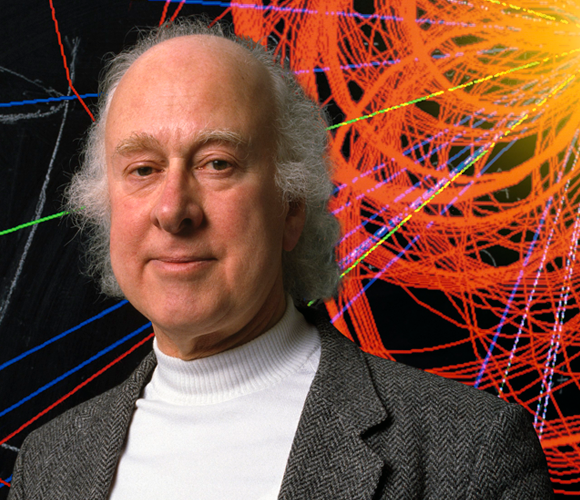 The Higgs boson’s discovery entailed numerous challenges and difficulties. Due to its large mass, it may only be formed following collisions at very high energies, and its short life-span (less and one billionth of a billionth of a second) renders it especially elusive. In addition, it cannot be directly detected by a detector, but only through examining its traces, after it has already turned into other particles, in a process termed decay. The Higgs boson can be envisioned as an invisible ball moving through space, and at a certain moment, exploding (or decaying), with parts spattering in different directions. If the explosion results in the ball’s parts becoming visible, we would be able to examine their properties and learn about the properties of the invisible ball that we cannot measure – the Higgs boson. Therefore, the physicists analyze the particles that they can detect, with the hopes of learning from them about the particles that cannot be measured using the current detectors. Herein lies another difficulty – the formation of the Higgs boson is relatively rare, occurring only once in about a billion particle collisions on average; most particles observed in the accelerator's detectors following a collision were not formed as a result of the decay of a Higgs boson, but from other processes. To find the Higgs boson, then, scientists must know how to find the products of its decay out of a flux of many other particles. Towards this, researchers use the theoretical model of the particle, and the way in which it interacts with other fields. The theory informs the researchers about all the different ways in which a particle can decay (i.e., its decay channel) and which particles they should be looking for in order to find traces of the Higgs boson. The theory also tells the probability of the particle to decay in a given channel. In the Higgs boson's case, in about 60% of the instances in which it is formed, it decays into a pair of particles – a quark called bottom, and its coupled anti-quark. The problem is that this pair forms during the decay of other particles as well, and therefore it is difficult to know if it originated in a Higgs boson or another particle. To find the Higgs boson, the researchers chose to search for rarer decay channels, which result in particles easier to identify in the flux of particles coming from different sources. This is what happened in 2012, when scientists detected the Higgs boson through the products of a rare decay channel, which occurs in only one in 500 instances in which the Higgs boson is formed. This discovery was sufficient for reporting that the particle identified has the same mass and properties as the Higgs boson, as described by the theory. In recent years, scientists have put their efforts into successfully detecting the Higgs boson through its most probable decay channel. To do so, they have to differentiate the detection of the quark bottom and its anti-quark coming from the Higgs boson from those originating in other sources. The scientists analyzed the information gathered in the detectors over the last two years, and using specialized data analysis techniques, they searched for instances of detection of a pair of quarks that occurred in proximity to detecting a different particle, a W or Z boson (weak-force carrier). According to the theory, this boson forms together with the Higgs boson, and since the Higgs boson is especially short-lived, the formation of the W or Z boson occurs nearly simultaneously with the decay of the Higgs boson and the formation of the two quarks. By focusing on events such as these, scientists have managed to identify a large number of events that most likely originated from a particle with similar properties to those of the Higgs boson, by disregarding all the background signals. In a preliminary paper, published by the ATLAS research group, including researchers from the Weizmann Institute of Science, the Technion, and Tel Aviv University, the researchers assessed that the probability of the finding being a result of statistical deviation, and not the Higgs boson, was nearly one in two million experiments. This finding was also supported with a similar level of confidence by the other CERN research group, CMS. The new finding provides substantial evidence for one of the properties not found in the original discovery of the particle – the manner by which it interacts with quarks. The properties measured in the recent discovery were in line with the predictions, and in the upcoming years, the researchers will attempt to improve the accuracy of the measurement. If this improvement will reveal a difference between the measured properties and those predicted by the theory, this will open a window for laws of nature that are not described by the Standard Model and are waiting for an explanation, or perhaps – for the next particle.